This project is a feature-added version of the Hammonator 1 Hammond organ to guitar amplifier conversion project. The Hammonator 1 circuit worked as a basic guitar amplifier, this version adds some very nice sounding vacuum tube audio effects. The 2RVT model number means: 2nd Generation, Reverb, Vibrato and Tremolo. Two copies of the Hammonator 2RVT amp have been made (see photos), both have been working nicely for years. The design has stood the test of time. The reverb uses a classic sounding tube circuit with a class A triode driving an 18" reverb pan. The reverb has both dwell (input) and output level controls. A pitch-shifting vibrato / volume shifting tremolo circuit is part of the signal path. The vibrato produces a variety of interesting phase shift sounds, from slow movement to warbling. Stereo vibrato can be easily achieved by chaining a second "clean cannel" amp's input to the Hammonator's second input jack, or by driving the amp from the "Side Channel Output" connection. Stereo greatly enhances the vibrato effect, the sound appears to move around the room. A cheap guitar practice amp makes an ok secondary amp, a tube amp such as the Spartacus or the Howler Monkey will produce an even better sound. The Tremolo/vibrato switch changes the pitch shifting vibrato effect into a volume shifting tremolo effect. The wide range of LFO speeds produce some interesting tremolo effects. Compared to the Hammonator 1, some extra wiring is added to the 6AV6 triode tube. A stand-alone sine wave LFO oscillator board is added for driving the vibrato/tremolo. The audio signal path is still 100% vacuum tubes, relatively modern digital circuitry was used to produce a high quality LFO signal. The LFO circuit is powered by the filament supply, the 6.3VAC is rectified and filtered to produce 7.5VDC. Another subtle feature of this amp is the use of 100nF capacitors on most of the 6SN7 cathode bias circuits. The 100uF caps work well at low frequencies, but have a lot of inductance at higher frequencies. The 100nF caps work well at higher frequencies. Paralleling the two caps produces a "super cap" that gives the amp a smoother frequency response. The vibrato/tremolo sine wave generator is a fairly involved sub-circuit to build. It may be prudent to start with the Hammonator Model 1 amp and add the vibrato/tremolo circuitry later. Be advised, the vibrato effect is worth the extra effort. The 6HU6/EM87 ray tube and associated components can also be left out of the circuit, or added later. The eye-candy effect is certainly worth a little extra wiring. Other magic eye tubes may be used by making the appropriate wiring changes. Russian made 6E1P/EM80/6BR5 magic eye tubes have been seen on eBay for good prices, they should work in this circuit by rewiring the tube pins. This is a fairly advanced-level project. It takes a lot of technician skills to deconstruct and reconstruct the ampifier circuitry. Also, there are plenty of lethal high voltages inside of this amp including 120 VAC and 420 VDC. The project should only be taken on by someone who has experience working with high voltage circuitry. The power should always be removed when working on the amp, the circuitry is designed to discharge the capacitors when power is removed, but it's always a good idea to short out the electrolytic capacitors before working on the amp. A friend of mine loaned me his vintage Magnatone Lyric amplifier, the amp has an incredible sounding pitch-shifting vibrato circuit that uses a varistor-based phase modulation scheme. The pitch-shifting vibrato effect could be described as liquidy or warbly and is similar to the sound produced by a rotating Leslie speaker. The type of varistors used in the Magnatone are no longer manufactured, they are difficult, if not impossible to find. The Magnatone's differential high voltage varistor drive circuitry also takes numerous tube stages to implement. This vibrato circuit uses a much simpler light dependent resistor (LDR) circuit to produce the required phase shift. The VFO used here has a much wider range of frequencies than the Magnatone's simple Tube VFO, this allows it to produce some amazing slow motion effects. There is an excellent Geofex article on The technology of phase shifters and flangers that covers the Magnatone circuit and more. Another excellent source of Vibrato circuit information is Magnatone Vibrato Design by Tim Robbins. The phase shifting vibrato circuit used in the Hammonator 2RVT was inspired by the transistorized Univibe circuit from the Geofex article, it is also similar to some Hammond organ vibrato circuits. The Liquidator Tube Phaser/Chorus Effect was an offshoot project that takes tube phasing to the next level. 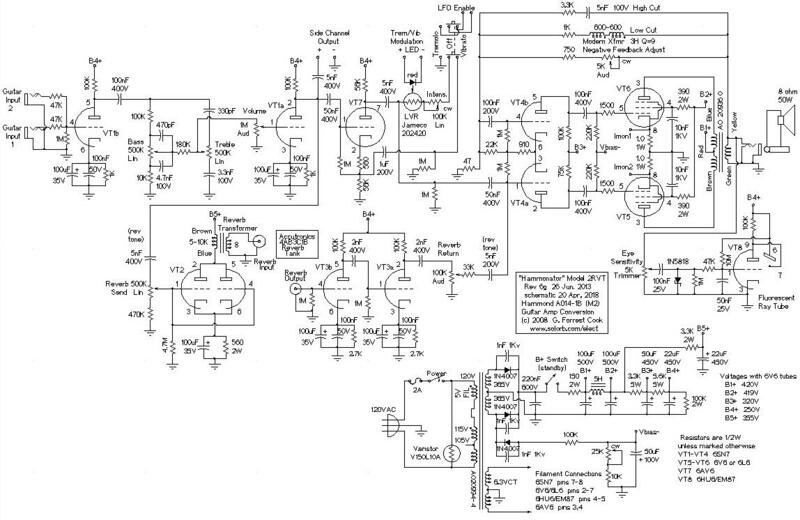 See the Hammonator 1 project for the theory of the basic amplifier. The Vibrato circuit is quite simple. The 6AV6 tube is running as a simple phase inverter, similar to circuits that drive many push-pull amplifier output stages. The signals on the plate and cathode of the tube are 180 degrees out of phase. When the Tremolo/Vibrato switch is set to Vibrato, the Light Variable Resistor allows the output signal to shift from one signal toward the other, depending on the amount of light it sees. When the Tremolo/Vibrato switch is set to Tremolo, one end of the LVR is connected to ground through a limiting resistor. As the light level on the LVR changes, the output signal is raised or lowered. Power for the LFO board is pulled from the 6.3V filament supply and full-wave rectified and filtered to produce 7.5VDC. The Schottky diode bridge rectifier produces a higher output voltage compared to silicon diodes, this is important for making enough voltage regulator input voltage. The 7.5VDC is regulated by the 78L05 regulator to produce 5VDC. 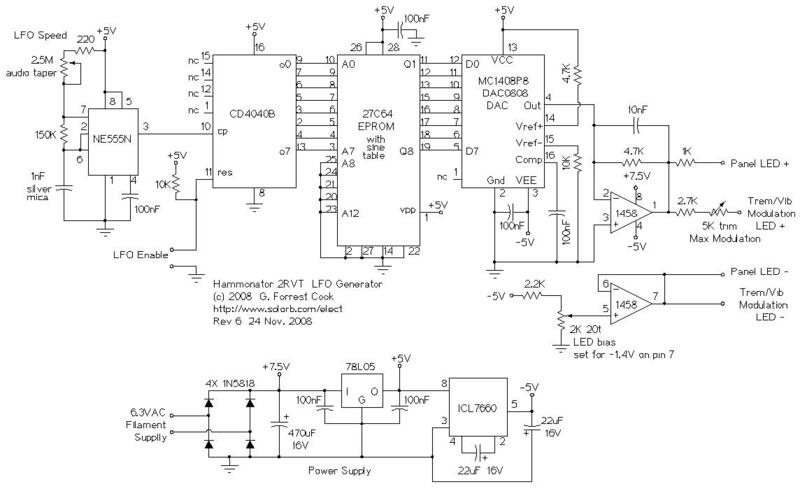 The 5VDC power is inverted with the ICL7660 chip to produce -5VDC. These three DC voltages power the rest of the LFO circuitry. The 555 timer IC is wired for astable operation to provide a digital clock signal. The speed of the oscillator is controlled by the 2.5M potentiometer. Ideally, the 2.5M speed control pot should be logarithmic taper. Unfortunately this part is very hard to find. If a more common audio-taper (reverse log) potentiometer is used for the speed control, it should be wired so that counter-clockwise is fast and clockwise is slow. This allows the LFO speed adjustment to have a normal feel. The LFO circuit is basically a stepped digital sine wave generator. An adjustable square wave clock signal drives a CMOS 4040 binary counter IC. The lowest 8 bits of the 4040 counter are used to generate addresses in the range of 0 to 255. The addresses are fed into the 27C64 EPROM. The EPROM is programmed with 256 steps of a digitized sine wave. Here are some Intel hex format files for programming the EPROM: Regular Sine Wave and Exponentially Weighted Sine Wave. The latter wave is recommended since it improves the LED/LVR linearity. The Digitized sine wave values are fed to the DAC0808 DAC, which converts them into analog currents. The op-amp on the output of the DAC converts the DAC output current into voltages in the range of 0-10V. The 100nF capacitor in the op-amp's feedback loop smooths out the steps in the sine wave. The LED/LVR optocoupler is driven by this sine wave voltage. The LED current is limited by the 2.7K resistor and the maximum phase deviation is adjusted with the 5K trimmer. The phaser effect's intensity is adjusted by varying the 100K pot that is in series with the light variable resistor (LVR). A microprocessor-based LFO circuit such as my Arduino LFO Waveform Generator V2 will work nicely in this amplifier. The design uses fewer parts. The negative side of the LED/LVR and the front panel LED are connected to an adjustable DC bias circuit which is set to around -1.4VDC. The bias is set so that at the zero point on the sine wave, the LED is just beginning to emit light. At the 10V point on the sine wave, the LED reaches the full brightness as determined by the intensity control. The LED bias insures that the response of the LVR is fairly sinusoidal, if the LED were not biased, the bottom of the sine wave would be effectively cut off. The Tremolo/Vibrato switch is a DPDT 3 position center off type. When the switch is in the middle (off) position, the LFO enable line is pulled high by the 10K resistor, causing the 4040 counter to reset, this causes the DAC to stop generating waves and turn off the LEDs. In addition to the new vibrato circuitry, a number of changes were performed on the Hammonator 1 to create the Hammonator 2. The black cardboard-coated electrolytic capacitor was removed because it vibrated and buzzed when exposed to loud sound from the speaker. Old electrolytics tend to emit funky chemical smells when they get hot, replace them with new capacitors. Additional front panel holes were drilled for the extra input and the vibrato knobs and switch. The vibrato front-panel LED was mounted in an existing screw hole. The tubes were renumbered, the 6HU6/EM87 was changed from VT7 to VT8 and the new 6AV6 was numbered VT7. The signal lines to the 6AV6 cross over the power amp circuitry, it is critical to run these through coaxial cable to avoid parasitic feedback issues. Only ground the input side of the coaxial cables to prevent a ground loop. A 3.3K/5nF RC array was added to the power amp's feedback loop and the pad resistor on the feedback control was increased to 750 ohms, these changes took care of an RF oscillation issue. The R-L snubbers on the 6V6 plates were deemed unnecessary and removed, this change was rolled back to the Hammonator 1 design. In one of the photos above, a blue glow can be seen under the power transformer, this effect was created by hot-glueing a piece of blue plexiglass between the pilot light and the chassis. The high voltage filter circuit was slightly modified to include a standby switch or turning the B+ supply on and off, tube life can be improved if the tube filaments are warmed up before applying B+. My Vacuum Tube B+ Delay circuit can be used in place of the standby switch for automatic power sequencing. 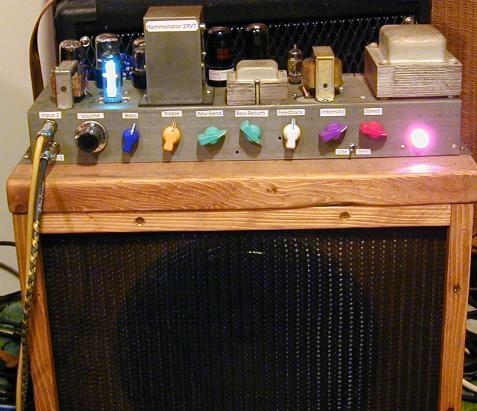 The Hammonator 1 article explains most of the amplifier conversion process. This photo shows the stripped inside and terminal strip locations of the Hammonator 2 RVT and this photo shows the completed inside wiring, the LFO board can be seen on the left side of the chassis. The vibrato circuit's optical coupler is constructed by placing a LVR and a medium brightness red LED inside of a piece of heat shrink tubing. The wires from the LED and LVR should be covered with pieces of wire insulation to prevent shorts. The LFO circuit board was built on a 0.1" grid perforated board. Connections were hand-soldered to solder type IC sockets. Soldered wire-wrap wire was used for most of the wiring, some #22 solid wire was used for the ground connections. The board was built to fit on the side of the chassis next to the power transformer, it was a very tight fit. A piece of clear plastic from a soap bottle was cut to the same outline as the board and installed between the board and the chassis to prevent shorts. The wiring from the LFO board to the front panel potentiometers should be done with shielded wire to prevent pickup of the oscillator signal by the amp's input circuitry. This amplifier drives a 15" guitar speaker nicely, this gives a baratone response. A more conventional 12" guitar speaker is also a good match for the amp and produces a brigher sound. The speaker was mounted in a heavy duty wood box that was made from 2x10 (top, bottom) and 2x8 (sides) dimensional lumber with a 3/4" plywood front and two 3/8" plywood back plates. The reverb tank was mounted inside the bottom of the speaker cabinet in order to enhance the sonic coupling between the speaker and reverb springs. If you choose to mount the amp head and reverb spring in their own box, be sure to orient the reverb for minimum pickup of hum from the power transformer. The Hammonator 2 amp is mostly operated in the same way as the Hammonator 1. The Tremolo/Vibrato switch selects the tremolo or vibrato effect, or neither in the center-off position. The Intensity control selects the depth of the vibrato or tremolo and the Speed control varies the rate of the effect. Unlike classic 1960s amps, the vibrato/tremolo speed covers a much wider range of frequencies and produces a more accurate sine wave response across these frequencies.